TheGunBlog.ca — The Canadian government’s possible ban on handguns and semi-automatic long guns such as SKS, AR-15 and FN-FAL rifles could wipe out more than $2 billion of guns and gear in private hands, based on estimates by TheGunBlog.ca. The estimates project only the value of firearms and equipment such as cartridge magazines, holsters and specialized tools that would become worthless in Canada if the government proceeds to prohibit privately owned handguns and firearms that some people call “assault weapons.” The projections involve many assumptions. The government might seize and destroy only the firearms held by authorized individuals, businesses and museums, but hundreds of millions of dollars in related gear becomes useless and valueless without the guns. The destruction of wealth invested in equipment doesn’t come close to assessing the full economic wreckage in case of new prohibitions. They would shut down companies, end sports careers, render individuals defenceless and eliminate thousands of jobs in and out of the firearm industry. Under some scenarios, a handgun ban on its own would be enough to annihilate Canada’s firearm heritage and industry by forcing stores, clubs and ranges to close. Many of them depend on handgun shooters for their survival and growth. These estimates consider only selected equipment. They don’t at all factor in the significant emotional, social and political costs of firearm bans, such as the feeling of being robbed, violated and betrayed by your government. They completely leave out the cost of lives lost to wildlife or criminals because individuals were disarmed. They also exclude the costs to get and keep a firearm licence, join a shooting club or get insurance. “You should lead an examination of a full ban on handguns and assault weapons in Canada, while not impeding the lawful use of firearms by Canadians.” — Prime Minister Justin Trudeau, Mandate Letter to Bill Blair, Minister of Border Security and Organized Crime Reduction, Aug. 28. May or may not happen. Could be fast or slow, via immediate seizures, forced turn-in, confiscation after death as the government does now, or some other method. What’s at stake? Handguns, “Restricted” and “Prohibited” rifles and shotguns (e.g. AR-15, FN-FAL) and many “Non-Restricted” rifles and shotguns (e.g. SKS, IWI Tavor, WK180-C). Newly banned guns and other gear might be sold to buyers in other countries, or on the grey and black markets. Hundreds of thousands of lawfully owned firearms were banned by previous laws (e.g. small handguns, FN-FAL, AK-47, HK91 rifles). Even if no new bans take effect, the continued destruction of the remaining “Prohibited” firearms would wipe out $156 million in family wealth under these assumptions. That amount is included in the overall estimate of a Trudeau ban given the uncertainty over how it may take effect. How to Count “Assault Weapons”? Automatic rifles were classified as “Prohibited” in the late 1970s and are already being confiscated from their owners as they die. This presented a challenge of understanding and accuracy, so we did our best to imagine what the prime minister was referring to. We interpreted “assault weapon” generously to include auto and semi-auto, centre-fire long guns. SKS, developed for the Soviet military, the most-popular semi-auto centre-fire rifle in Canada. IWI Tavor, developed for the Israeli military. AR-15, developed for the U.S. military. For the purpose of this estimate, we included the RCMP’s count of all “Restricted” and “Prohibited” rifles and shotguns, as well as our projected number of 1 million “Non-restricted” semi-auto rifles and shotguns, excluding those in .22LR. 1.5 million men and women with a standard firearm Possession and Acquisition Licence (PAL). 580,000 people with a “Restricted”-class licence. 50,000 people with a “Prohibited”-class licence. Data Source: RCMP, Valid licences at 30 June 2018. See here. Some cost $200, some cost $200,000. A Smith & Wesson revolver that sold for $80 in the 1970s might go for $800 new plus tax today. Some firearms are unique historical items or precious art whose market value is unknown. The value of existing “Prohibited” firearms heads to zero as the pool of potential buyers shrinks. Some items have mainly sentimental or symbolic value. Some are rusted junk of no value. Some people never buy parts or accessories beyond ear and eye protection, or perhaps trigger locks, carrying cases and a safe. 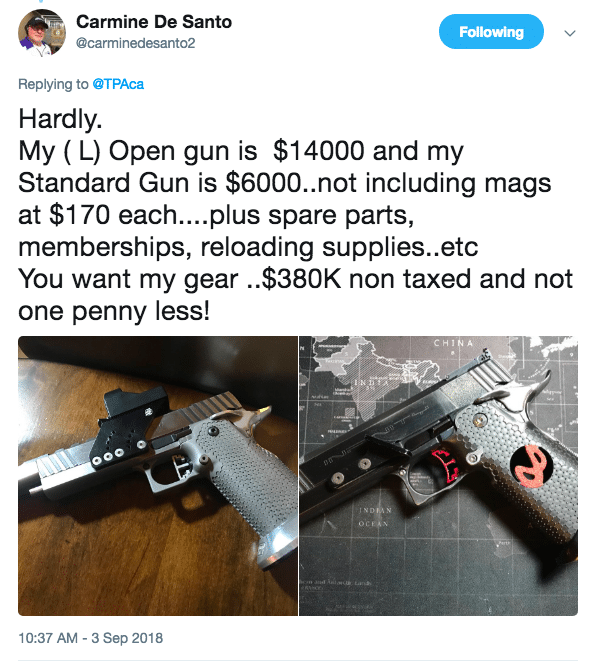 Others invest hundreds or thousands of dollars to customize a single firearm. The numbers add up fast. If you bought 5 mags for $30 each, that’s $150. New sights? Easily $120. Range bag? $20-350. Red-dot? $500+. Handguns and “parts and accessories” are in a value ratio of about 3 to 1. In just the past decade, Canada imported more than $300 million in handguns and $100 million in handgun parts and accessories, before tax. Almost all of it ends up in the homes of sport shooters. We excluded gear that wouldn’t automatically become worthless in case of a ban. Ammo: We spend a lot on ammo, roughly the same amount as on guns. Shoot it or sell it before any ban takes effect. Trigger locks, gun safes, gun cases, cleaning supplies: Use on allowed guns or sell. Eye and ear protection, clothing, gloves, caps, pads: Can still be used or sold. TheGunBlog.ca estimated the value of firearms and related gear, with input from large independent gun stores in Alberta, British Columbia and Ontario. We aimed for the low-to-middle range of estimates on value and quantity. Every week that goes by adds $1 million to the value of “Restricted” handguns and rifles owned by Canadian households, based on the running average of about 1,250 new purchases per week. 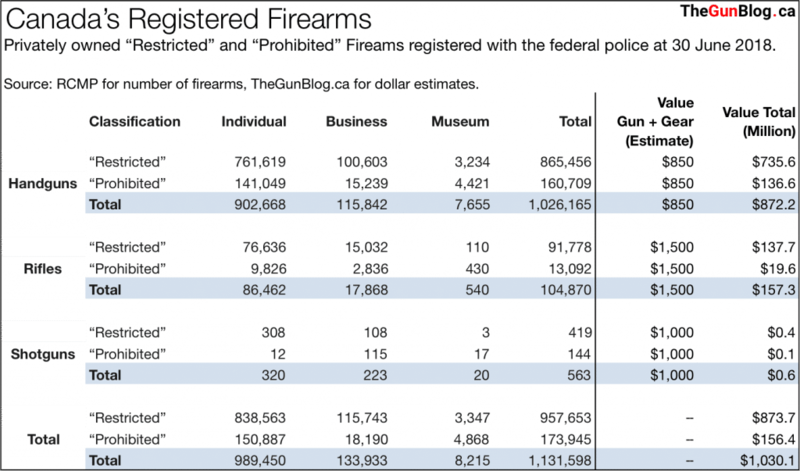 TheGunBlog.ca estimated the average price of new firearms last year here. Sample valuation: handgun ($660) + 3 mags ($90) + case ($20) + tax ($90) = $860. cost of feeling robbed, violated and betrayed by the government. cost of life of people who couldn’t defend themselves. cost of getting and keeping a licence, club fees, range fees, insurance. cost of opposing the bans. cost of losing objects of symbolic or sentimental value. cost to study, plan, prepare, execute, administer, record, process the bans. cost of businesses that would shut down. cost of gun clubs and target ranges that would shut down because they can no longer afford to stay open. cost of thousands of jobs that would be terminated in and out of the firearm industry. Some politicians pretend that criminals would stop being violent if the government bans firearms from hunters and sport shooters. All firearms are banned already for anyone who doesn’t have a firearm licence authorized by the federal police. Gun bans disarm only those who obey them.